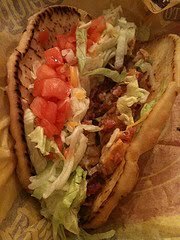 At the risk of having a trio of douchebags materialize out of thin air, I went ahead and ordered the Bacon Club Chalupa, thus falling off the Taco Bell wagon once again. Granted, I was in a drive-thru on City Avenue, where the likelihood of a combination stabbing/carjacking is ten times that of getting hit on by a few feathered-hair passersby than it would be in the brightly lit and clearly exclusive club shown in the above commercial, so I wasn't too worried about an onslaught of douchebags. I'm also a dude. I also do my best not to carry a clutch, but every now and again, it's unavoidable. But enough about my fashion sense. Let's talk about what happens when Taco Bell runs out of ideas thinking outside the bun and goes back to thinking inside the bun. 1. The crunch of the toast, even though it doesn't get its name on the marquee, is one of the most important parts of the BLT. The chalupa shell, limp from an extended bath in the fry grease, was a terrible proxy for the toast. 2. The lettuce and tomato were minutes away from being rancid. Even the smoky flavor of the bacon couldn't mask the acrid taste. 3. Speaking of the bacon, it was diced so small that I could have snorted it. 4. The chicken was barely there, maybe a chunk or two, and not worth commenting on. 5. Another key ingredient to the BLT is the gloppy, oozes-out-the-side mayonnaise (a very good thing). In its stead, Taco Bell substitutes "club sauce," a watery thin condiment that looks and tastes like whitewash. The Chalupa was a staple of my college diet (see my physique for obvious evidence of this fact) and I can say categorically that I never ate one while sober. TBell always tastes great when you are wasted and the nauseous feeling in the morning can be attributed to either culprit. It makes me sad that the level of bacon-nicity is so sub par. If not for goopy sauce and egregious amounts of bacon, why even heave my fat arse off the couch to retrieve on of these gut busters?